Shoppers in Brazil had the chance to view and purchase bracelets and other handicrafts produced by the women of the Yawanawa indigenous group during a week-long event that intends to empower women and indigenous peoples through economic opportunities. It’s part of an ongoing project Forest Trends (Ecosystem Marketplace publisher) and the IKEA Foundation launched. 10 September 2015 | From September 1 to 7, shoppers at the Via Verde Shopping center had an opportunity to glimpse products that you don’t often encounter in a shopping mall. The retail complex – located in Rio Branco, the capital of Brazil’s Acre state – played host all week to “Raitihu,” a pop-up concept store featuring handicrafts produced by women from the indigenous Yawanawá community. 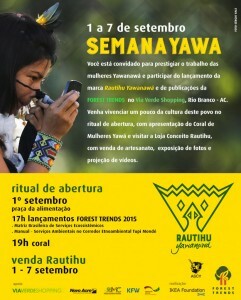 EntitledSemana Yawá, the initiative was part of an ongoing partnership between Forest Trends’Communities and Markets Program and the IKEA Foundation, which sets out to promote women’s empowerment and strengthen economic opportunities for indigenous communities in the Brazilian Amazon, among other goals. Semana Yawá kicked off with an opening ceremony on September 1, which featured a performance by the Yawá Women’s Chorus, as well as photo and video exhibitions celebrating the Yawanawá culture. Community spokesperson Júlia Yawanawá described the occasion as “a tribute to all Yawanawá women.” More than 140 bracelets, bangles, necklaces, and other handicrafts were sold in the first night alone, according to Jornal Opinião. The ceremony was attended by officials from the Institute on Climate Change and Regulation of Environmental Services (IMC) and the Elias Mansour Foundation (FEM), as well as indigenous and civil society leaders. Also in attendance was José Roberto Borges, the Director of Forest Trends’ Communities and Markets Program. Coinciding with the launch of the Raitihu crafts brand, FT also introduced an innovative community resource – a “manual” on climate change, ecosystem services, and compensation for those services in the Tupi Mondé Ethno-environmental Corridor (Serviços Ambientais no Corredor Etnoambiental Tupi Mondé). Emphasizing the important role that indigenous communities play in environmental stewardship, the Communities and Markets program also used the opportunity to present its comprehensive Brazilian Matrix of Ecosystem Services. 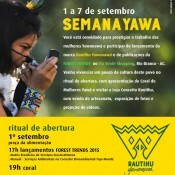 Semana Yawá may have officially ended this week, but organizers hope that its success will boost broader efforts to promote sustainable livelihood opportunities for Yawanawá peoples. In addition to celebrating their artistic, musical, and cultural traditions, the week also gave Yawanawá women an opportunity to showcase their entrepreneurial skills and their efforts to achieve greater economic independence. This concept perfectly reflects the mission of the partnership between the IKEA Foundation and Forest Trends: while the initiative seeks to help indigenous communities prosper by practicing sustainable forest stewardship, it also strives to help women gain a larger role in decision-making and train youth to succeed in an increasingly interconnected economy. Will Tucker is the Senior Communications Associate at Forest Trends. He can be reached at wtucker@forest-trends.org.